It is a kind of flatbread (the soft kind) that belonged at the great holidays like Christmas (yule) and other great occasions. At Christmas it was especially expected that it would be part of the offerings on the table. In Norway there were many variations and every community had their own specialty. The name also had many variations in the local dialects - "lepsa", "lemse", and so on. The most common way to make it is to use an unleavened dough, but it can also be leavened. 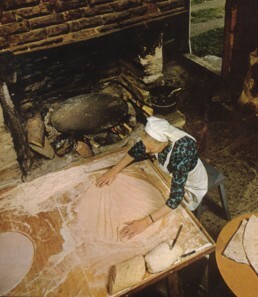 The "krotkake" from Hardanger is from a dough with yeast or a leavening agent. It should be stored dry after baking and and can be moistened with water before being served. It can be served with butter, sugar and cinnamon. Or, a homemade cheese-like thing called "mysost" depending on the region of Norway where you find yourself. It can also be served as sidedish with dinner. Some tips: First of all it is important to have a suitable griddle for preparing. The dough should be stirred as little as possible and you should knead it lightly. Otherwise it may become tough. Soft variety should be stored in cloth such as thin towels after baking on the griddle. If you want to keep it for a longer period it can be frozen. Flattening the dough in a thin layer before baking on the griddle can be difficult, so do it lightly. The dough should be thin, without gaps and it should be even throughout. There are different tools that may be wise to have on hand. A proper baking through, a baking table, a long and flat knifelike wooden spatula and a good rolling pin with which to flatten the dough. And not to forget, you need plenty of time. I picked up this book at my Grandparent's home recently and fell in love with it! Rolled lefse with butter and sugar is a treat that brings on nostalgic memories of childhood - yet while I loved the food, I had no idea how to make it or how it came into being. 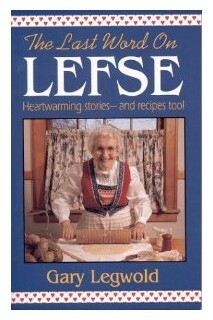 "The Last Word on Lefse" compiles everything from the history of this Scandinavian food, to funny anecdotes from Norwegian-Americans who excel at making the stuff, to jokes and songs and, of course, a number of recipes that I am looking forward to trying. I have yet to boil and rice the potatoes for my first batch of lefse, but after reading this book, I can't wait to get cooking and recapture some of my Nordic heritage.